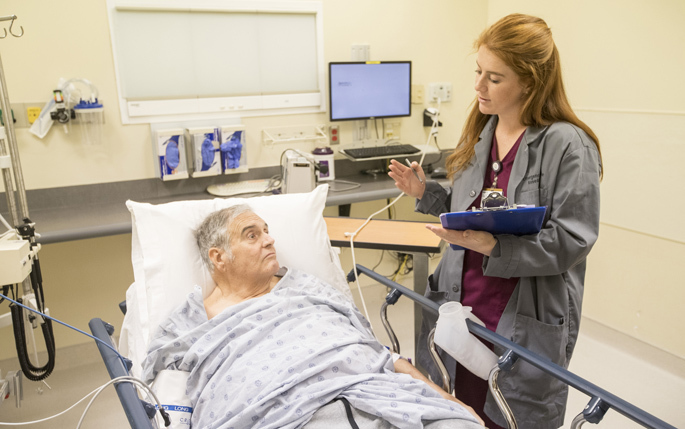 Many doctors and nurses recall their first patient interaction — a rite of passage that occurs during medical or nursing school training. Now an innovative program is pushing the patient encounter for a few Vanderbilt University students into the undergraduate years. Kate Sborov is one of only 10 undergraduates enrolled in the Immersion in Emergency Care Research course, which is being offered for the first time by the Center for Medicine, Health, and Society in the College of Arts and Science. The course is a collaboration between Vanderbilt University faculty and Vanderbilt University Medical Center (VUMC) with the objective of engaging undergrads interested in medicine, nursing or biomedical sciences with clinical research in the VUMC emergency department. “Although it was quite nerve-racking to speak to our first patient, on our own, the experience was incredibly rewarding,” said Sborov, a senior. “I remember being very nervous while talking to him (the patient), because although we had rehearsed this interaction in class the week before, I had never talked to a patient one-on-one before in this manner. While talking to him about our Perspectives Study, and then going through the questions, I remember stumbling over a few words in order to figure out the best way to ask each question,” Sborov said. Alan Storrow, M.D., associate professor of Emergency Medicine in the School of Medicine, and associate director of Research for the Department of Emergency Medicine, are instructors in the course, which gives students an extensive bedside, hands-on clinical research experience. The course is divided into two parts: a classroom lecture program which highlights elements such as emergency care delivery, human subject research and data collection techniques, and a clinical research experience that requires students to spend four hours each week in the emergency department where they function as research associates, working with the ED staff to help identify patients who meet certain criteria for clinical trials. They become part of the emergency care research team. Karen Miller, R.N., MPA, director of Clinical Operations for the Department of Emergency Medicine, sees the value of including undergraduate students in the research teams. “We’ve always been interested in the patient’s point of view, and we wanted the students to have an opportunity to talk with patients, to really understand health care and issues that they might be able to look at in a different way,” Miller said. The students work four-hour shifts in the clinic every week for three months and keep a journal. “I think it’s been fun to be the inaugural class because we work so closely with the entire emergency medicine research team to make this the best course we can. We’ve been super involved in the process and I really like that,“ Sborov said. In wrapping up this semester, the students will finish their time in the classroom. They’re required to have a mock written and orally presented research proposal. “They are our future of medicine and nursing, and their ideas are what’s going to shape our future. I think they will make decisions that will help us challenge the way health care is and make it better. It gives you hope,” Miller said.